...from Paris to Le Pecq led to an increased interest of rowing on the Seine river between Argenteuil and Bougival. Alphonse Fournaise was born into a family of boat carpenters based in Chatou. He settled on the island in 1857, having purchased from a cousin a boathouse and a restaurant. His business developed rapidly thanks to the vogue and popularity of rowing. About 1860 until 1877, he opened the Restaurant Fournaise and added some extensions including the famous balcony painted by Renoir under the title Luncheon of the boaMadame Fournaise ting party. kept a close eye on the perfection of cooking ; Alphonse, the father, dealt with shipbuilding, organization of nautical parties and administration. Alphonse, the son, was in charge of selling, leasing and the maintenance of boats. Alphonsine, his sister, was the charming attraction of the place thanks to her welcome and beauty. The Fournaise restaurant became a meeting point for painters, writers, political and financial important personages. Impressionist artists, fond of the open air, admiring the light and reflections on the waters, found on the island all the required elements for their paintings. 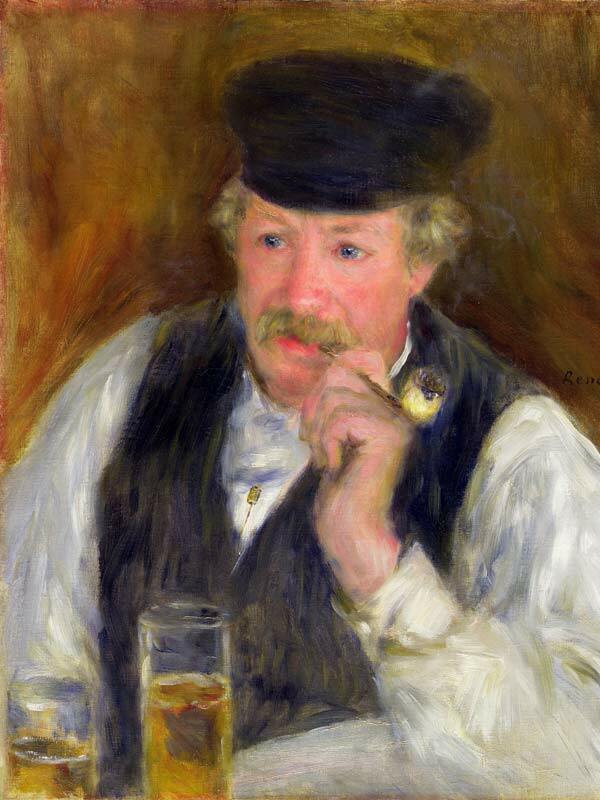 "Monsieur Fournaise, dit l'Homme à la pipe" - Renoir, 1875, Sterling and Francine Clark Art Institute Williamstown - Mass. ... came there, Gustave CAILLEBOTTE, a rich painter owned several boats there who initiated his friends into boating and sailing, DEGAS and his friends LEPIC, A. GAUTIER, LELOIR, Gervex and some other less wellknown artists also regulars. ... was very frequently at the Fournaise restaurant from 1868 to 1884. ‘’I was always at Fournaise’s, where I had at my disposal for painting superb girls as much as I wanted.’’…. 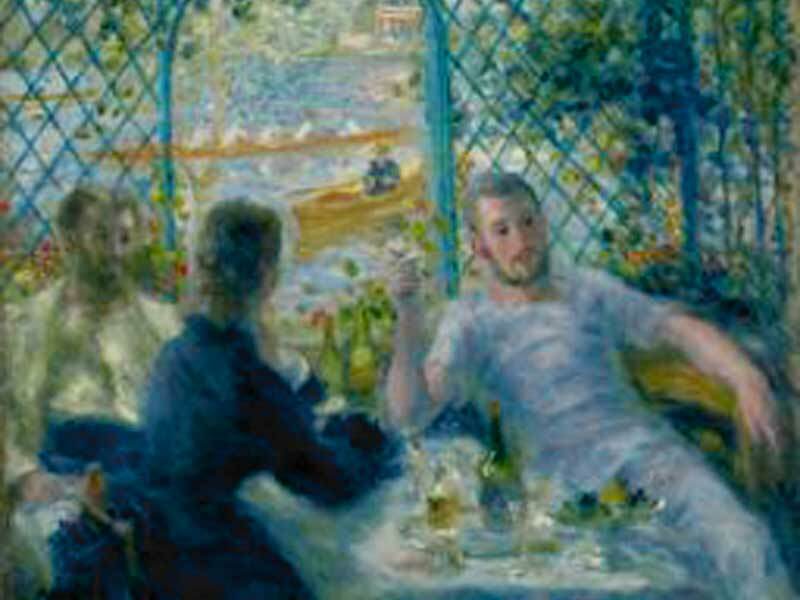 A lot of paintings by Renoir show the Seine river at Chatou with its bridges,and rowers ; one of the most famous paintings was the one where his friends posed on the balcony of the restaurant entitled Luncheon of the boating party . Among others, include Alphonse Fournaise and his sister Alphonsine (Phillips Collection, Washington – USA). ... a young painter, living in Chatou, came to meet the artists and a love story emerged with Alphonsine for fifty years. He painted four scenes : the four ages of life on the outisde walls of the restaurant, which have been renovated. Many artists enjoyed decorating in the restaurant, doors, walls or terrace and also wrote a poem. Amongst writers, one of them, Guy de MAUPASSANT, was particularly attracted by the beauty of the place. He was fond of rowing at Chatou between 1873 and 1890, and frequently stayed at Maison Fournaise which is called le restaurant Grillon in one of his novels (La femme de Paul). In his other stories : Mouche, Sur l’eau, Essai d’amour, Yvette, he perfectly described the Seine river, rowing, La Grenouillère and its’’ faun’’. My only great fantastic passion was the Seine river during ten years.